You are more likely to survive cancer if you spot the signs and symptoms at an early stage. 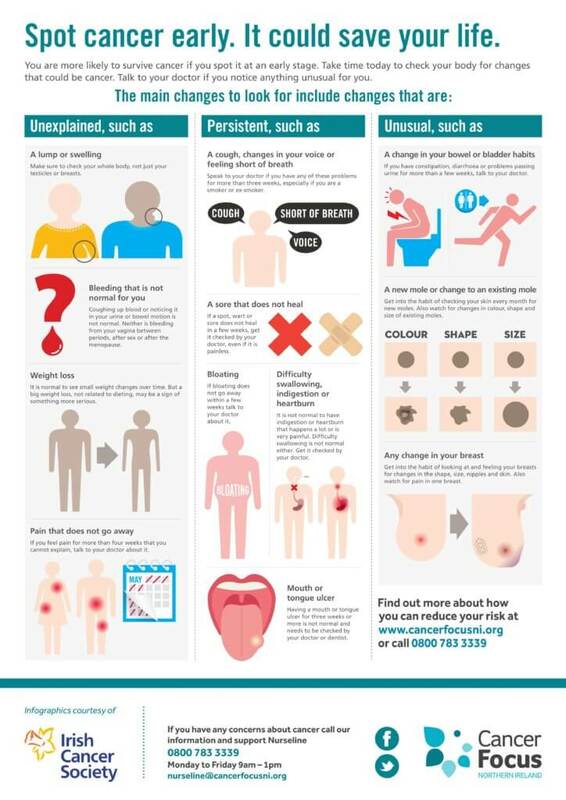 Take time today to familiarise yourself with the most common signs and symptoms and check your body for changes. Talk to your doctor if you notice anything unusual for you. The chances are that it will not be cancer, but getting it checked out is not wasting anyone’s time. Find out more about the common signs and symptoms of cancer below, or about more specific types of cancers here. If you have a question about cancer call our free and confidential support Nurseline on 0800 783 3339 to speak with a specialised nurse (available Monday – Friday, 9am – 1pm). You can also email us on nurseline@cancerfocusni.org.